Turkish historians have uncovered the oldest-known example of a signed written consent form. Dating back to the 16th Century Ottoman Empire, the discovery suggests the use of these forms — in this case permission to remove a bladder stone — was practiced long before it was adopted in the West. There’s a debate among historians as to when informed consent for medical treatments and human experimentation was formally introduced — informed consent being the practice of acquiring a patient’s voluntary consent for the administration of treatment after a doctor has adequately explained the benefits, risks, and alternatives. It’s a sophisticated concept, one driven by respect for an individual’s autonomy and its relation to legal obligations. As early as the Ancient Greeks there existed the Hippocratic Oath, a duty from physicians to avoid harming their patients — a practice that was largely based on the honor system and not subscribed to by most doctors at the time. Fast forward to the first half of the 19th century, a time when physicians routinely lied or withheld medical information from their patients. Driven by the attitude that “doctors know best,” consent was still not on the table. It wouldn’t be until the 20th century, with the introduction of the 1947 Nuremberg Code and a 1957 medical malpractice suit that introduced the term “informed consent” that the practice entered into the legal lexicon. But not so fast, say historians Omur Sayligil and Hilmi Ozdenb of Turkey’s Eskisehir Osmangazi University. Their new study, published in the journal Annals of Saudi Medicine, highlights a written medical consent form that’s nearly 500 years old. 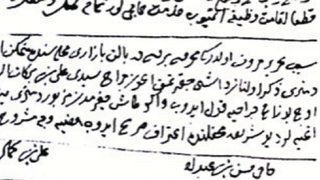 The historians found the written consent form in Qadi registers, important documents for historians studying the Ottoman Empire’s medical past. Qadis — Muslim judges who interpret and administer Ottoman Sharia Law — kept records to document their decisions and work. In this case, a patient, in the presence of witnesses, gave written permission to allow surgeons to remove a stone in his bladder — along with a promise not to sue should something go wrong, thus relieving the physicians of legal responsibility. The document also shows that the patient paid a fee for the health care services requested. “This finding illustrates that the concept of informed consent has been long established in the Ottoman Empire when compared to the Western world,” conclude the authors in the study. Read the entire study at Annals of Saudi Medicine: “A written consent form dating back to 1524 in Bursa Şer’iye (Sharia Court) records and a proposal of a new start date for consent forms”.